Pre-heating a PCB Assembly is Illustrated Above Where a Bottom-Side Application of Temp-Controlled Warm Air is Made Prior to Soldering or De-Soldering. Before the the introduction of bottom-side preheating stations in the early 1990's, two of the most critical processes which are instrumental to successful SMT & BGA tasks at the bench were previously the two most commonly neglected: 1) Properly preheating the printed circuit board (PCB) before attempting reflow, and 2) Initiating a quick "cool down" of the solder joints after reflow. This applies to all bench work from design, prototyping and low volume production runs to rework and repair of the PCB assembly (PCBA). Still, today because the two fundamental processes of pre-heating and post-cooling are often ignored by benchtop technicians, many problems arise. Poor Rework & Repair is Expensive Worse, with rework tasks, costly PCB's which are sometimes considered "repaired" are, in fact, worse off after the rework than they were before. While some "rework" damage can sometimes be detected by a qualified, post-operation inspector, in many cases the damage is not always visible or even immediately manifested in a circuit test. While I will mostly address the disciplines of rework and repair in this paper, keep in mind everything here applies equally with PCB prototypes, design tasks and low volume PCB runs. Certainly, the application of elevated thermal ranges (600°- 800°F or 315°C - 425°C) to the PCB for extended periods of time can present the potential for many problems. Thermal damage such as lifted pads and traces, substrate delamination, measling or bubbling, discoloration, board warping and burning is usually noticeable to a trained inspector. However, just because one hasn't "burned the board," doesn't mean that it is not damaged. Typically, the "unseen" harm done to PCB's by high temperatures can be even worse than the many problems listed above. Decades of countless testing has repeatedly shown that PCB's and their components can "pass" post-rework inspection and testing only to later fail at a higher than normal rate due to the degradation of the circuit and components experienced during high temperature "rework." Such "invisible" problems (internal substrate fracture and component degradation) happen because of too rapid heating acceleration and unequal expansion of dissimilar materials. Ominously, these problems may not be visible or even detectable in an initial circuit test, yet still latently lurk within the PCB assembly. Although the "rework" looked good -- like the old saying, "the operation was a success, but unfortunately, the patient died." Imagine the tremendous thermal stress which occurs when a PCB, which has been stable at an ambient or room temperature of 70°F (21°C), is suddenly subjected to a localized application of 700°F (371°C) of heat from either a soldering iron, desoldering tool, or a hot air jet. There is an immediate delta temperature change of 630°F (332°C) to the board and its components. "Pop-corning" refers to internal IC or SMD degradation from moisture within the device is heated too quickly mini- ruptures occur. Hence, preheating is imperative at the bench. This short video teaches the 4 Methods of PCB preheating. They are also taught below in this technical paper. Thermal Ramping at the Bench. For these very reasons, as early as the 1980's I began lecturing the semi-conductor industry and those involved in labs and factories who were soldering or desoldering devices on PCB's to first "ramp up" to reflow temperature with a short preheating cycle. Thermal profiling was as important on a bench as on the production floor. After all, the simple fact of the matter is most every single production process for solder reflow in printed circuit board assembly work already includes a pre-heating stage just before your soldering or desoldering work. Whether an assembler uses wave soldering, IR Vapor Phase, or convection reflow, each method is typically prefaced with a preheating or "soaking" of the board at temperatures generally between 212°F to 302°F (100°C to 150°C). Preheating Eliminates Problems! Most quality issues in PCB prototyping and rework can be eliminated with a short preheat cycle to the PCB before attempting solder reflow. It has certainly worked well in the initial production reflow assembly for years. The benefits from preheating are multiple and compounding. Additionally, preheating your printed circuit board assembly will permit you to use a lower, final soldering reflow temperature. In fact, this is the primary reason that wave soldering, IR/Vapor Phase, and convection reflow are all done at temperatures below 500° F (260°C). Yes, these same low reflow temperatures and shorter soldering dwell times can be achieved at right the bench with only the addition of preheating. Preheat Activates Your Flux removing oxides and/or surface films metal surfaces to be soldered along with extraneous volatiles. This cleansing from the activation of the flux just prior to reflow enhances the wetting process for better joints. 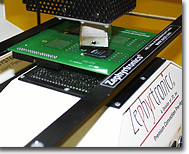 Preheat Raises the Entire Assembly to a temperature slightly below the melting point of solder (reflow point). This substantially reduces the delta between your assembly temp and the final reflow temp application minimizing thermal shock risk. Thermal shock occurs when rapid heating increase temperatures inside an assembly at different rates. The resulting thermal discrepancies create thermo-mechanical stresses that embrittle, fracture and crack materials with lower thermal expansion rates. SMT Chip Resistors & Capacitors are especially prone to such damage from thermal shock. But if the PCB assembly is preheated both a reduced temperature and a shorter final reflow stage application is acheivable. PCB's With Heavy Ground Planes, high copper content or that are densely populated create tough heat sinking loads and makes rework unduly slow. Without preheat, the only solution is either a further elevated temperature application and/or a longer dwell time at the reflow stage...both of which should be avoided. Engineers and techs are pleased to find preheated PCB permit using solder paste and/or lead-free alloys with pin-pointed, precision hot air reflow by a hot air pencil. High-volume production soldering processes typically have these final thermal ranges: A.) wave soldering operations at temps at 464°F - 500°F (240°C - 260°C); B.) vapor phase soldering at temps at 419°F (215°C); and C.) convection oven soldering at approximately 464°F (240°C). In fairness, while one can approach these very low temps at the benchtop, one can never get down to the exact temperature level. This is because rework requires localized application of soldering temps to a single targeted component while production reflow requires full application of reflow temps to the entire PCBA. Further complicating the task of benchtop soldering or desoldering is the industry requirement that adjacent components to a targeted chip must never be subjected to over 338°F (170°C). So the only time benchtop soldering temps in rework can be identical to those of high volume production are when PCB's are roughly the same size as the targeted component for soldering. Rework & Prototyping is Localized and typically targets a single chip at a time prohibiting applying solder reflow temps to both the top and the bottom of entire PCB. So this localization necessitates higher initial thermal ranges than those seen in production process in order to offset the load of the entire PCBA which can only be elevated to 338°F (170°C) max. Still, that fact does not negate the need to make benchtop soldering as close as possible to those lower, safer temps of production processes. What's critical in high volume production is still equally critical at the bench. Especially for semiconductors! Certainly, the punishing temperatures of 650°F to 800°F (343°C to 426°C) currently found in rework with soldering irons, desoldering tools, and hot air jets, may be OK for more robust thru-hole chips, but never for SMD's and BGA's. What's the solution? Introducing a brief pre-heating stage into your benchtop soldering process. 1.) IR Preheaters: There are many drawbacks to IR which is why it really never completely caught on. Some of drawbacks which have been enumerated in articles in SMT Magazine, Circuits Assembly and in white papers at electronic conventions are the difficulty in ramping temps (some are better than others); shadowing caused by high profile components on PCB's; and if the IR preheat grid is very large it can make working on small PCB's very uncomfortable for the technician (a very common complaint). Still another great disadvantage to IR preheaters is that they can never truly be "temperature controlled" without the technician having to pre-assemble an external thermocouple and tape it to every board before working on it. And that's a continuous hassle and headache replete with quality pitfalls and problems with inconsistent results. There are more, but these are some of the key setbacks. NASA & JPL: 'IR Preheaters Are Risky': Addressing the critical preheating rework process for plastic and heat sensitive components in their 49-page published report, two JPL engineers, Dr. Rajenshuni Ramesham and Dr. R. David Gerke, wrote "Hot plates and infrared preheaters are not recommended for this type of rework. The reason that they should not be used is that the thermal reaction times, energy transfer rates and efficiency are never consistent. However, they can be used for large metal and ground-plane boards in limited applications, e.g., where the size of the board matches that of the preheater in area." Citing the late William Scheu, the authors point to the preheating superiority of bottom-side forced convection. A NASA Survey by JPL spotlighted more IR preheat deficiencies: "They have little capacity to ramp and soak to perform properly engineered repair scenarios or to support the creation and application of complicated thermal profiles. They also are limited in their ability to preheat beyond the physical dimensions of the heating surface. Hot-air preheating can be ramped, soaked and, on some systems, synchronized with the reflow process, permitting duplication of the actual profile used in manufacturing the assemblies. BGA's and photoelectrical parts are sensitive to higher temperatures and any attempt to preheat with marginally controllable sources is risky." -- NASA & JPL Survey of Rework Methods & Equipment for Various Packaging Technologies." -- August 2005. 2.) The Oven: Using ovens to pre-heat PCB's before soldering or de-soldering chips can yield uniform temperature profiles as it warms both the PCB's top and bottom. But one can't crawl inside an oven and simultaneously perform soldering tasks. Still, one can preheat a PCB in an oven and then race with it in high-temp gloved hands back to the bench, but it's hardly a solution either. Also, (and this is important) quickly cooling for solder joint strength is nearly impossible with ovens. 3.) The Hot Plate: The obvious limitation to hot plate is not all PCB's are single sided. In today's world of hybrid and mixed technologies, PCB's that are entirely flat or plane on one side are rare. PCB's typically have heat sinks, connectors, jumpers and transformers on both sides of the substrate. These uneven surfaces on the board present an indirect path of conduction from the plate to the PCB. Another Hotplate Disadvantage is once soldering is done, hot plates continue applying conductive heat to the PCB and chips--- even if turned off because they have residual stored heat in the plate. This continued heating impedes cooling down the new solder joint. Delayed cooling of the joint can induce an unwanted lead pool formation making weaker, inferior solder joints. 4.) Forced Convection AirBath™ Preheat The market has long spoken with regards to the distinct advantages and superiority of a warm air bath in the pre-heating process. Forced convection completely disregards the topography (or bottomography) of the PCB, allowing immediate, direct access of the warm air into all of the nooks and crannies of the PCB assembly. As with the new popular forced convection commercial ovens, circulating warm air is far more effective than static warm air. Testing has shown that PCB preheating with less than 10 cubic feet per minute (285 liters/minute) in volume of bottom-side heated air is ineffective even with very small boards. If preheat volume is too low, technicians are tempted to compensate by turning up the temp settings of their top-side tools (soldering irons, hot air nozzles). Quick cool-down of the PCB, critical with BGA's, is also possible with an AirBath™. It is no wonder that bottom-side, temperature controlled, forced convection is the industry standard for preheating PCB assemblies: there are so many advantages. Why Hot Air Preheaters Are More Efficient Than Other Methods? As mentioned, the challenge of at the bench is that the rework process should mimic that of initial production in both processes and profiling. It is interesting to note that just as pre-heating the PCB assembly prior to reflow has proven essential to successful PCBA production, so has a quick cool down of the assembly immediately after reflow. Yet these simple two processes have traditionally been equally ignored within most lab prototype soldering and rework processes. However, the swift migration to SMT from thru-hole technology -- along with the miniaturization of delicate components -- makes both preheating and post-cooling more necessary than ever before. The Model: All high-volume :PCB production solder reflow equipment -- such as conveyor ovens and wave solder machines -- incorporate a final cooling stage after the reflow stage. Fanning ambient air across a PCB as it exits a reflow zone is not just a common practice, it is an industry standard. Post-cooling™ is also essential at the bench, too. There are two important points I want to make here. 1. Quick Cooling Prevents Quality Problems: A slow cool down of a PCB assembly after solder reflow is not a good thing. It lets unwanted lead-rich crystals pooling within the liquid solder. Such lead-rich pool formation at the metallurgical interface results in physically weaker and inferior solder joints. Slow cooling lead-free solder alloys result in solder joints filled with pits, voids and stretch marks. This is easily prevented with accelerated cooling. Quick cooling yields tighter grain structure, higher quality and robust solder joints. 2. 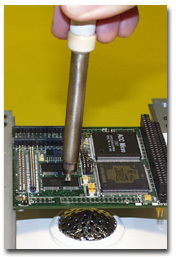 Quick Cooing Prevents Solder Bridges & Moving Chips: A quicker rate of solder solidification by rapid cooling reduces the time for accidental movement or vibrations to the PCB after solder reflow, which cause a host of quality troubles like solder bridging, especially with Ball Grid Arrays (BGA's) or tomb-stoning chip capacitors and resistors. This is why production conveyor ovens all have cooling fans precisely at the final phase of the soldering process. Quickly cooling down your PCB immediately after solder reflow is actually more important at the soldering bench than it is in initial high volume production. Ignore it at your own peril. Allowing Lifting Nozzles Sooner Without Accidental Bridging. The benefits from a proper preheating and a post-reflow cool down of the PCB assembly are many and compounding. The time involved to include these two simple procedures into a technician's basic rework routine is negligible. In fact, while the PCB is preheating, a technician can be busy doing other prep work such as applying paste and / or flux to the board. Bottom-side convection preheat enhances soldering and desoldering processes at the bench whether one works with a traditional through-hole soldering irons, hot air soldering pencils, desoldering thru-hole connectors or desoldering with LowMelt® De-solder Wire. BottomSide Effective Preheat is Essential for all BGA rework and repair. In fact, even BGA and CSP re-balling requires preheat. Bottom-side, effective pre-heat is your best solution. And preheating is even more important with lead-free soldering or rework. Certainly, the assurance of not having to replace lifted traces or lands, or needing to re-troubleshoot a newly reworked board because it will not pass a circuit test translates into genuine time savings. Further, it goes without saying, that the cost savings realized from not having to scrap PCB's thermally damaged in "rework" must factor into any technician's equation. An ounce of prevention is worth a pound of cure. Preheating & Post-Cooling Prevent Scrap Scrapped PCB's cost money and time. Substrates with delamination, measling, bubbling, warping, discoloration, scorching or with cracked ceramic chips, degraded semi-conductors, bridged solder joints, weak solder joints with pits and voids can set your company back all because proper pre-heating and post-cooling were not performed. These two processes are the two simplest and yet, perhaps the most necessary benchtop processes of all. -- David Jacks, Los Angeles, 1996. Postscript from the Author: How prescient this article seems now some sixteen years later. Today, our reality at the electronic benchtop has us working with SMD packages so small they are only visible under a microscope along with micro-BGA's and the most-delicate of ceramic capacitors and glass diodes, all of which are at extreme risk of thermal damage from high temperatures and rapid thermal expansion. The advent of lead-free solders has further exasperated the reflow process for SMD and BGA prototyping, production and rework. In all of these cases, it turns out that effective preheating before reflow is the only solution, isn't it? BGA Rework requires preheat. Lead-Free rework requires preheat. Micro BGA rework requires preheat. SMT rework requires preheat. And yes, if you really want quality solder joints, even Thru-hole rework requires preheat. My first SMT benchtop "machine" was the old Ungar® 4700 hot air soldering system introduced in 1982, some thirty years ago! That simple machine was quite revolutionary in its day because we had the foresight to engineer bottom-side preheating right into the machine. Yes, we were laughed at back in the "old soldering iron days", but time has proven us right. I am still kidded from time to time as "Mr. Preheat" and I must say that I like it. --- DJ, 2012. ABOUT THE AUTHOR: David Jacks was Director of Engineering with three Fortune 500 corporations along with the two largest soldering equipment companies on earth for 13 years before launching Zephyrtronics in 1994 with fellow engineer, Randy Walston. David's professional design career stretches from the early 1970's in Los Angeles. His original products have been spotlighted in feature articles in both Popular Science® and Popular Mechanics® magazines. He has designed original products, tools and appliances marketed by Sears®, Black & Decker®, RadioShack®, Motorola®, Stanley Tools, Snap-On Tools®, Rubbermaid®, CooperTools®, Holmes Hardware, Weller®, Hakko®, Ungar®, Farmer Brothers® and Brewmatic®. Any electronics catalog of soldering equipment, tools and products today reflects David's acknowledged and still enduring influence on the printed circuit board industry world-wide. Indeed, the successful implementation of the miniaturization of electronic components and their adaptation within labs by design engineers for prototyping is, in part, attributable to David. David holds many patents (both utility and design) in North America, the European Union, Japan and around the world. His patented inventions have been cited as prior art by firms from IBM to Mitsubishi. He has authored technical articles for international journals, and routinely speaks to electronic professional societies. ©1996 - 2011, 2012, 2013, 2014, 2015, 2016, 2017-2018, 2019 by Zephyrtronics®. All rights reserved. The information, text, images, photographs, charts, graphs you receive online from Zephyrtronics® are protected by the copyright laws of the United States. The copyright laws prohibit any copying, redistributing, retransmitting, or repurposing of any copyright-protected material. 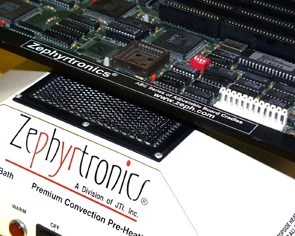 Zephyrtronics is the registered trademark property of JTI, Inc. "The Science of Zephyrtronics" and "Simplicity Through Innovation" and "Zephlux" and "ZeroLead" and "ZeroTouch" and "Zero Balling" and "Zero Residue" and "Post Cooling" and "Post Cooler" and "AirBath" and "SolderGlide" and "SolderMill" and "ZeroTouch" and "Just So Superior" are the protected trademark property of JTI, Inc. "Zephyrtronics" and "Low Melt" and "Air Fountain" and "Fountainhead" are the registered trademark properties of JTI Inc. *The above names are the registered property of their respective owners.